The Facebook Giveaway has ended. Thanks to everyone who participated and helped Since I started my Sweeties page on Facebook it has been growing quickly. 1. 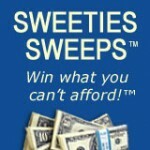 Visit the page by going to www.facebook.com/pages/Sweeties-Sweepstakes/496040130251 2. If you are not already a Fan click the LIKE button. 3. At the top of the page click Suggest to Friends and invite your existing Facebook friends. You can also just email, Twitter, or text your friends and ask them to join. The next prize will be given away when the number reaches 2,500. I will keep the updated numbers, prizes available to be won, and winners posted here so you will need to check back occasionally to see where we are. The winner will also receive an email or “shout out” on Facebook if I don’t know their email. For the facebook fan contest, how will you know how many friends each person referred? We decided on this contest to choose 10 random people from our fan base to receive a prize when we reached 500. We added about 80 fans in 4 days…I don’t want to count winners manually… I just can’t figure out how to number the fans?? I think you have to randomly just pick people from the list of Fans. I congratulate them directly on their Facebook page. Sometimes people don’t get back to you and you have to pick new winners. Just do the best you can. With Facebook there is no real good way to pick winners. Seriously, I love the look of those Green Bottles. If I don’t win I might just buy one. Haha. How are you choosing winners? I was thinking about having a random drawing but I don’t want to count to fan (let’s say) 338…. You are getting VERY close…to 2,000! I have an elderly friend who is a die hard “DUKE” fan. If I win this, the shirt is his!